NOTE : If you have this label on a plant in Australia, it is may NOT be leonamiana !! T. recurvifolia var. subsecundifolia has been mis-labelled in Australia for many years as leonamiana. T. leonamiana has lilac flowers, many of the plants with this label in Australia do not ! Peter Tristram 04/10. Chris Larson 05/14. Peter Tristram .... "A few of us have the plant pictured, originally from Renate we think, but rarely bloomed. 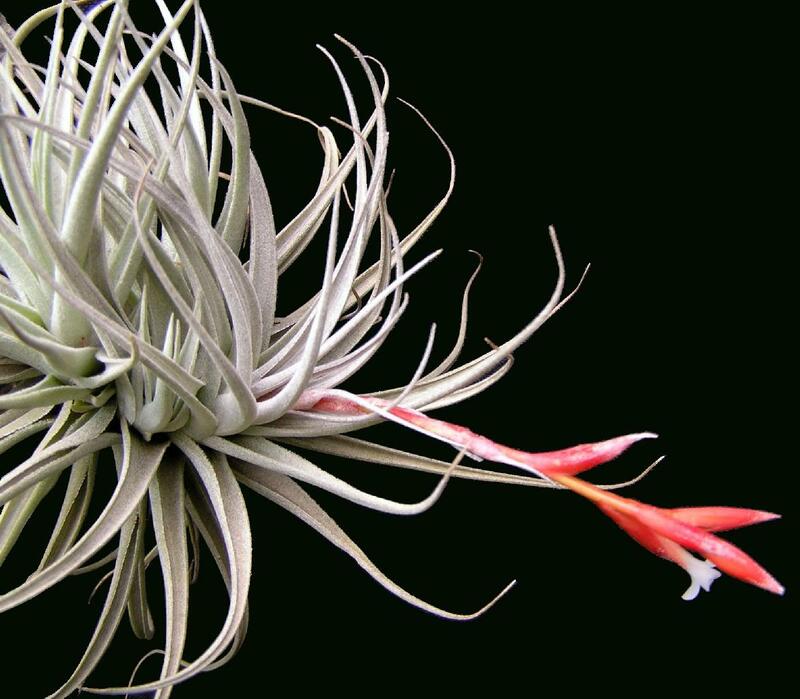 The petals are very distinctive and seem to fit with Brent’s plant, which was discussed at length a year or so back, as well. It fits the description fairly well too. The species is very different to the other ‘leonamianas’ still sold around the place." Chris Larson .... "T. leonamiana. Ex Lotte Hromadnik – this one is from up in the Amazon – unlike the one that has been confused with this name." 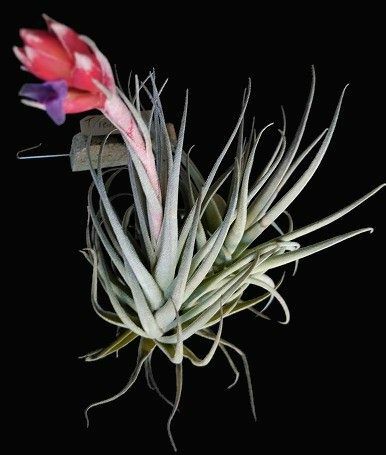 Chris Larson ... "From what I can gather from US comments, Harry Luther was of the opinion that the plant that we in Australia accept as subsecundifolia (collected in southern Brazil) are leonamiana, which is why the US Americans insist that it is so. 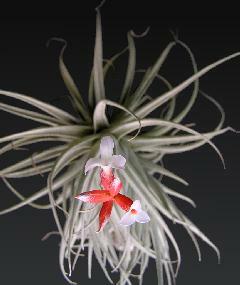 It is the Europeans, & us Aussies, that consider the blue flowered form from up in the Amazon is “the true leonamiana”. My interpretation is backed by UD’s listing of leonamiana on the Taxon list." Derek Butcher ... "If you read the whole saga of T. leonamiana, Renate has the gut feeling it is a hybrid or mutation. Note the Seidel saga, where Seidel who is supposed to have found the taxon kept trying to convince Renate with all manner of variations. To my mind if it is described as having blue flowers then it cannot have white flowers. Isley tells me he has a new source where he has blue flowers and white flowers and I say the answer is simple - only the blue flowered ones could be called T. leonamiana!" Ian Hook, 10/07. Peter Tristram 03/01. 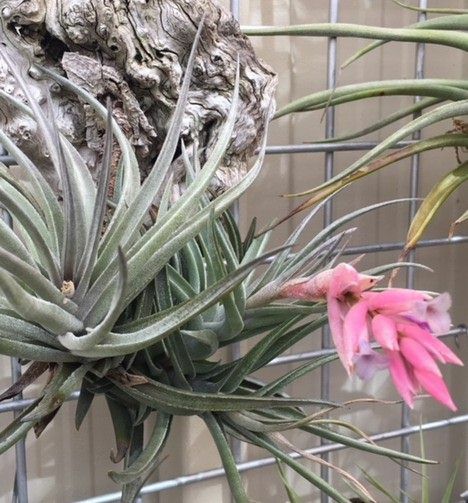 Another supposed T. leonamiana. This one from Holm. It looks like recurvifolia v. subsecundifolia but with slightly mottled, blue petals. Adds to the variety! Ken Woods 10/09 as leonamiana. "Photo lighting went wrong". Mark Supple 10/11. Mark Supple's plant ... Keys close to leonamiana. Originally from Isleys late 1980's. Possibly some Isley plants are hybrids, possibly the original species, as described, was a hybrid. 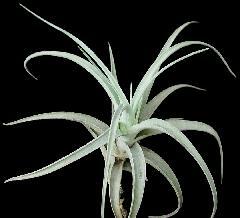 A white flowered form is also in Australia, although they do show mauve tints as they fade. Derek Butcher to Geof Lawn, Re: T. Candy Corn parentage. You can only use what Chris Larson has advised is on the Tropiflora website. Dennis's answer suggests that this parentage is just a guess and could well be the reverse. As I have said ad nauseum, parentage is only a guide. We must remember that most Americans follow Harry in their use of leonamiana but Australians follow the Germans! See below for the sorry story. As for variations in Candy Corn you must take into account cultural conditions AND don't lose the label! Tillandsia leonamiana E. Pereira, Bradea I: 437,pl. 1. 1974. 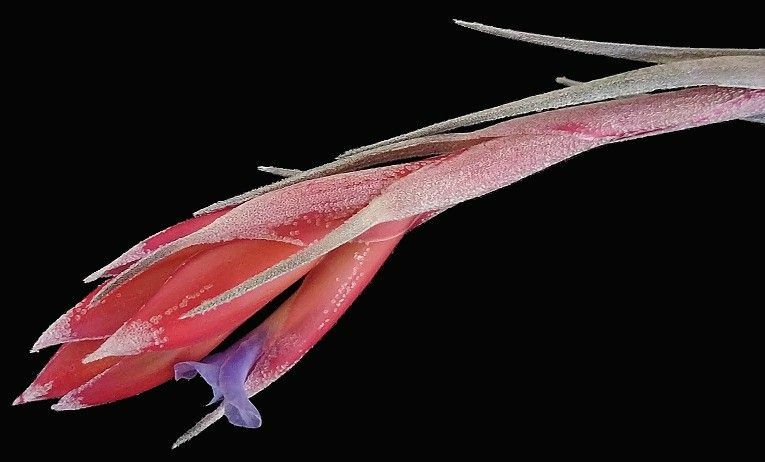 Related to T. pohliana Mez and to T. meridionalis Baker this new species differs from both in the length of the stalk in the shape and size of the sepals, in the very much plicated filament, in the not caudate ovuli and in the much larger flowers with purplish corolla. 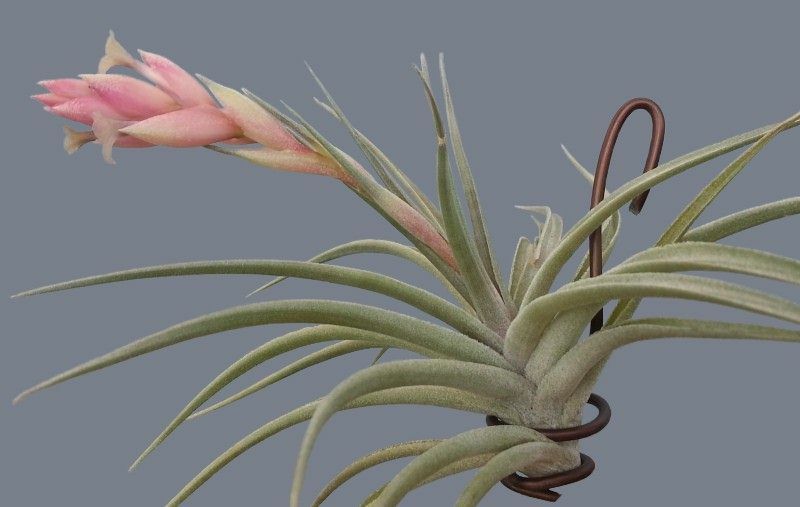 We dedicate this new species to our good friend and colleague Leonam de Azeredo Penna, author of several papers on ecology and garden cultures and continuation of the Dictionary of useful Plants of Pio Correa (finished with, the conclusion of vol.6; vol.5 being in press). This dictionary would have never been finished were it not for his dedicated action, even obstinacy, with use of his solid knowledge. We herewith rend sincere homage with respect and admiration to whom dedicated all his life not only to public service but also to the collectivity. 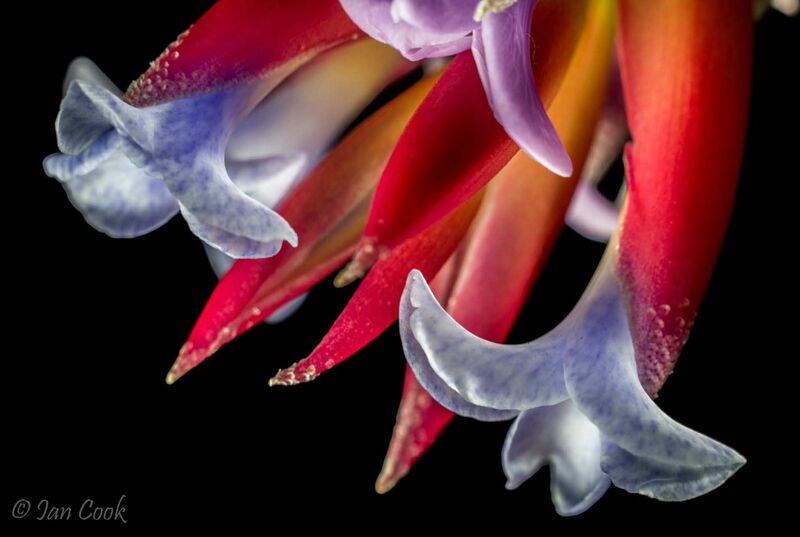 Plant caulescent, the stem dorsiventral, ca. 20 cm long, conspicuously curved. Leaves polystichous, recurved but not secund, thick, rigid, long-attenuate from base to filiform apex, 20 cm long, to 25 mm wide, strongly concave, densely cinereous-lepidote. Scape-bracts oblong, 30 mm long, linear-laminate, pale-lepidote. Inflorescence simple, lax, polystichously few-flowered. 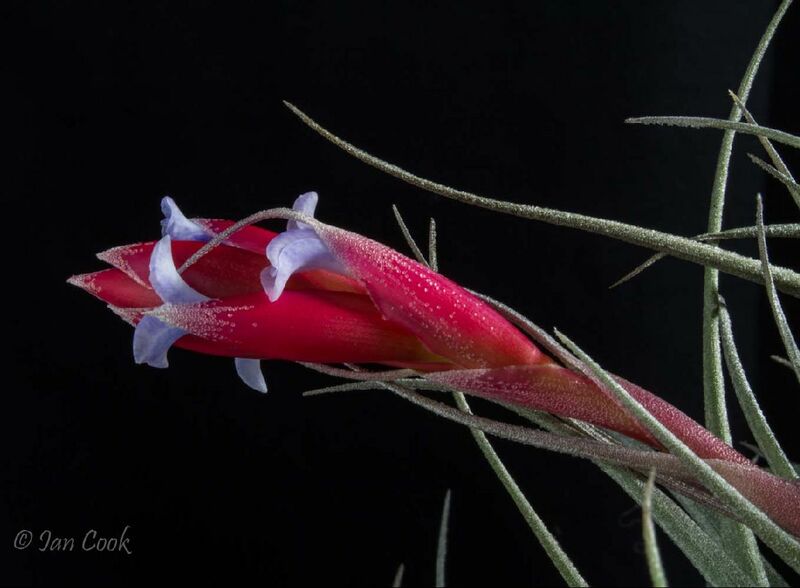 Flowers erect, sessile, 35 mm long. Stamens shorter than the petal-claws; anthers 3 mm long; ovary 4 mm long; ovules obtuse. Type. Without exact locality, extreme north of Minas Gerais, Brazil, 1 Oct 1973, A. Seidel 668 (holotype HB 60772 n v). 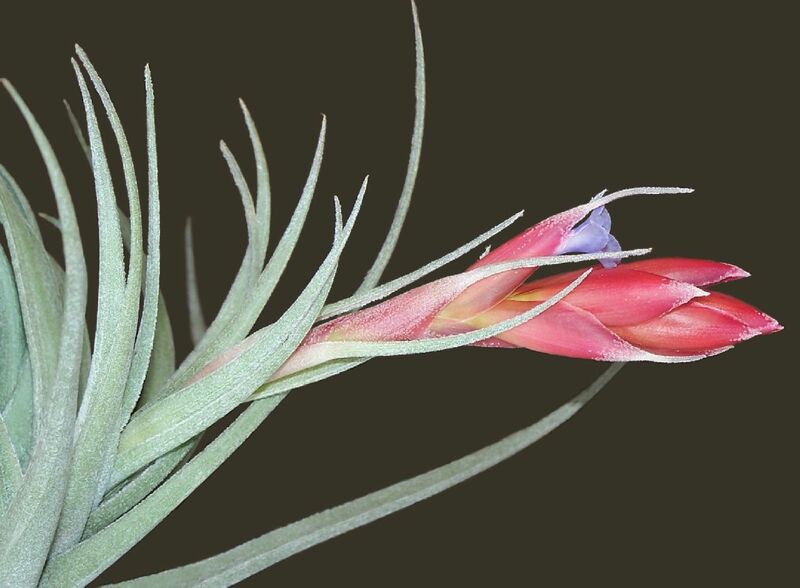 According to the author, Tillandsia leonamiana differs from T. pohliana Mez and T. meridionalis Baker in the size of its scape, the shape and size of its sepals, the very much plicated filaments, the ecaudate ovules, the much larger flowers, and the purplish corolla. 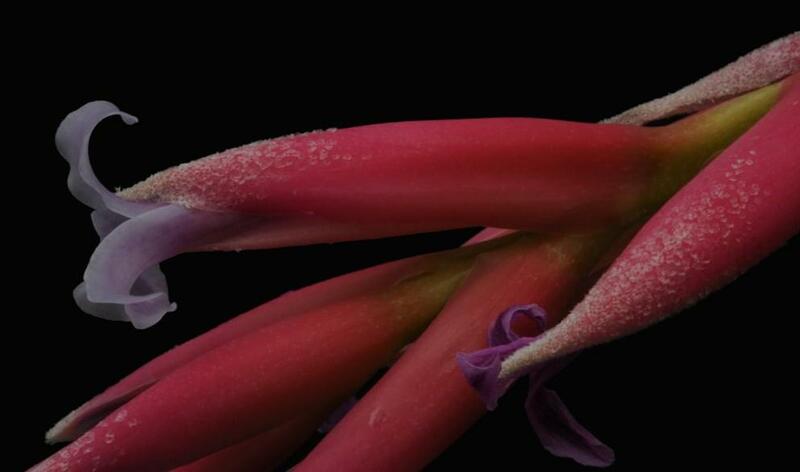 The texture of the sepals is not given but their shape is much more like that of T. meridionalis. T. minasgeraisensis had been imported from Brasil by various nurseries in America and Germany named T. leonamiana E. PEREIRA, but it differs greatly from the description of this dubious plant. The type specimen for T. leonamiana E Pereira was collected by Achim Seidel 1. October 1973 in Minas Gerais (in the extreme North of Brasil, without exact location), and E. Peireira described it in 1974. Renate Ehlers ordered T. leonamiana from Seidel in 1979. As the plants did not fit the description, Harro Heidt and Reinhard Thieken brought plants again in 1980 and 1981 from Seidel-nursery. 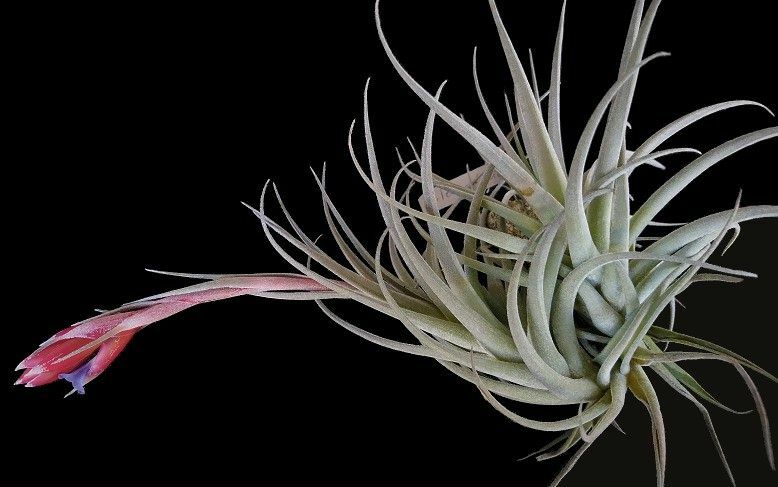 Renate Ehlers has 3 different types of plants in her collection from Seidel, but none of them showed all the characters, mentioned in the description. Plants had been imported from Brasil by various nurseries in America and Germany named T. leonamiana E. PEREIRA, but all I examined differed greatly from the description of this dubious plant. 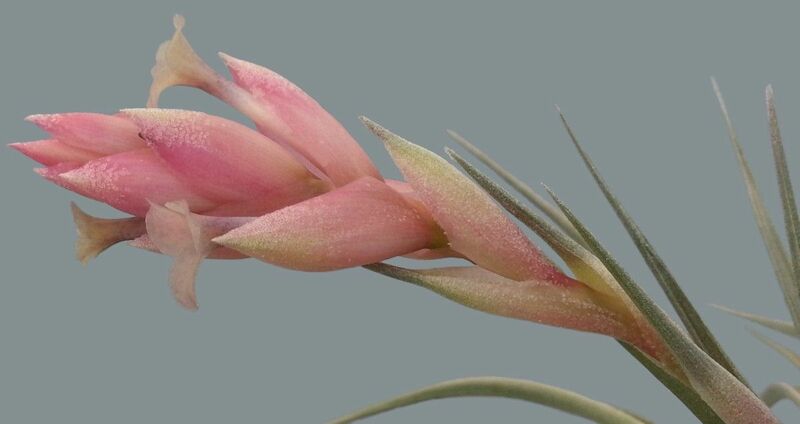 The inflorescence was never as narrow or laxly composed of few flowers as shown on the drawing by Pereira, the sepals were never subfree, connate for l mm, and never lepidote. 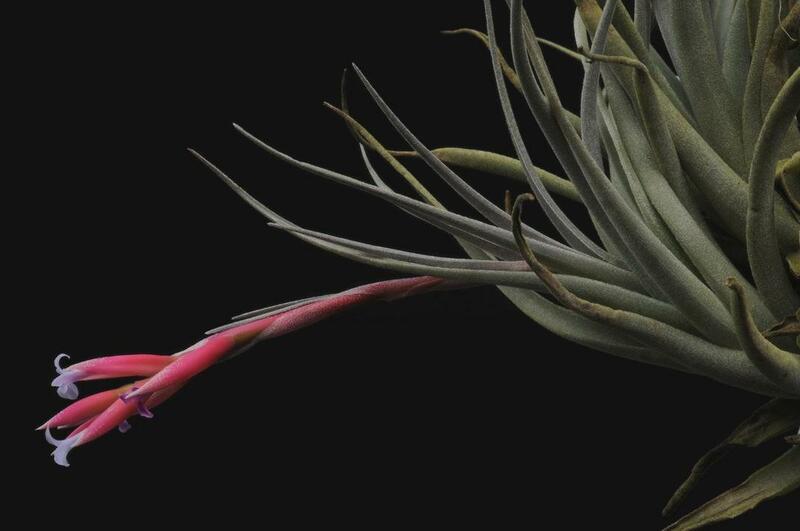 In 1979, at about the same time, Achim Seidel sold plants as species number 720, from southern Brasil, and showed a photograph in his catalogue. This plant # 720 corresponds exactly to T. recurvifolia var. subsecundifolia (Weber & Ehlers) Till, which has its habitat in the South of Brasil, Estado Parana, near Vila Velha. 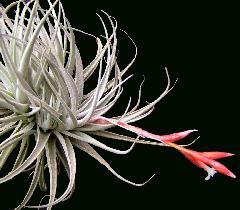 T. leonamiana E. Peireira was collected by Achim Seidel No. 668 in Minas Gerais, extreme North of Brazil, and he should have known the plant. But we then find, after the publication, that spec #720 is in fact treated as T. recurvifolia var. 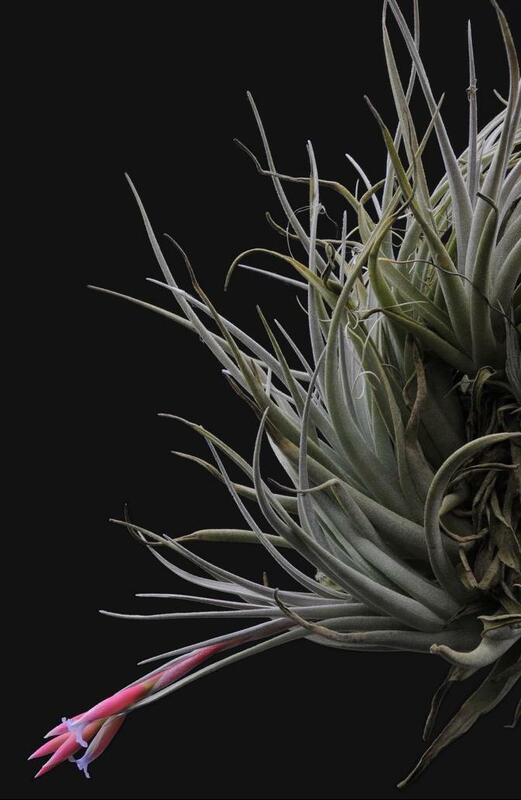 subsecundifolia by Seidel. It is clear that Seidel did know that this plant was different to T. leonamiana. There remains many questions, because the plant has never been collected again in northern Brasil. 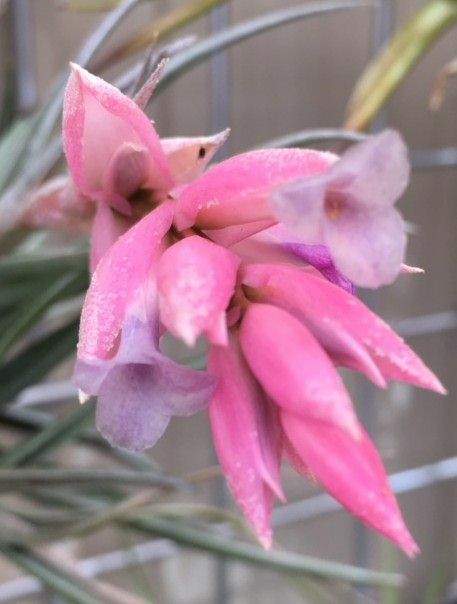 One possibility is, that T. leonamiana is a natural hybrid, - this would explain that there are different types of plants around in the nursery of Seidel, but none of them really fitting the description. 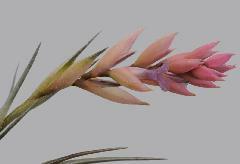 For a long time there was some confusion between T. leonamiana and T. recurvifolia var. subsecundifolia, and Harry Luther treated the latter as a synonym of T. leonamiana. 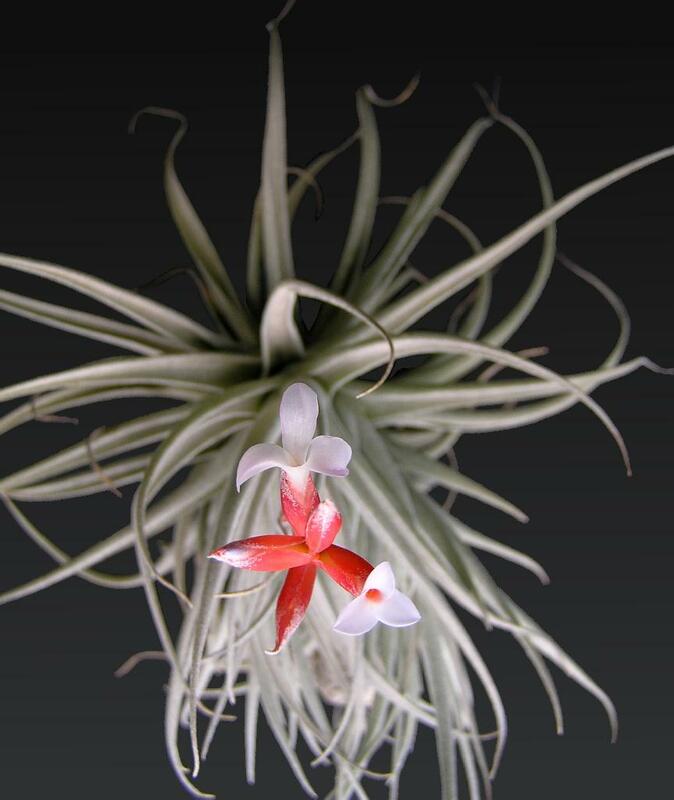 However, a comparison of the types of both taxa revealed the following differences: in T. leonamiana the leaves are larger, the flowers are bigger, the sepals and petals are bigger than in T. recurvifolia var. subsecundifolia, and petals are violet in the former but white in the latter, and also the strong geographic separation is a fact. 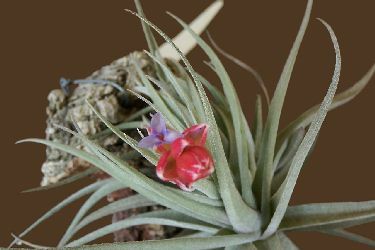 Just now, in April 2006, some plants, which I got in 1980 from Seidel as T. leonamiana Pereira from Minas Gerais are flowering. I compared these plants with the descriptions and they fit quite well, in nearly all characters, to T. leonamiana. The few characters where they disagree are: inflorescence not lax, the internodes of the flowers are smaller at anthesis, but elongate and by postfloral they are very similar to the drawing by Pereira, the sepals much more connate and not lepidote. They differ from T. recurvifolia var. subsecundifolia (Weber & Ehlers) Till by the following characters: leaves longer, 20 cm long, not only 15 cm, flowers 35 mm long, not 26 mm, sepals 20- 22 mm long and connate, not 17 mm and free, petals 35 mm and blue, not 27 mm and white, Anthers 3 mm, not 2 mm, ovary 4 mm long, not 2 mm. In any case, these plants fit much better to the description of T. leonamiana Pereira, and they come from Minas Gerais, from extreme northern part of Brasil, whereas T. recurvifolia var. subsecundifolia (Weber & Ehlers) Till grows only in southern Brasil, Parana, near Vila Velha. Until any material is collected from northern Minas Gerais, which fits the description of T. leonamiana it seems wiser to keep both taxa apart. Steve Molnar .... "Have been waiting a while to see if the label matches this plant. Very happy to see it was correct. Also have T. recurvifolia var. subsecundifolia also coming into flower. But this is the one I was really hoping I had in my collection. It's a beauty." Peter Tristram .... "A can of worms, as we have discussed many times, including at the TPE. I saw Steve’s pics on facebook and asked the same question regarding source. If we knew what was wild collected and from where and what was grown from seed so possibly hybridised, we’d be in a better position to make decisions. There’s lots to read on the DVD. I first saw the description in Smith’s monograph and have struggled with it ever since. Plants labelled ‘leonamiana’ from Brazil began to appear in the trade which only partly matched the description confusing everyone. It appears that these were from the area where T. recurvifolia var subsecundifolia grows. Like some of the old descriptions it lacks rigor, being based on a single specimen and without exact habitat locality. It’s worth reading/rereading Renate’s notes in the DVD, especially considering the relationship to the later described T. recurvifolia var subsecundifolia. There are also photos of Linz’s ‘leonamiana’, which is what I also imported from Lotte. Confusing! Keep as much info on the labels as possible. I guess that only plants originating as leonamiana from Seidel could be considered the real deal. Are any in Australia or NZ?"